Lagging personal incomes for Oregonians and their families is the biggest issue facing our state. The 2014 Oregon Legislature can deliver on a handful of specific proposals to accelerate an economic recovery that is still leaving many Oregonians outside of the metro area behind. Oregon’s per capita income, even with the recovering economy, is still nearly 10% below the national average and 15% below the incomes of Washingtonians. If Oregon incomes were simply at the national average, each Oregonian would be earning $3,900 MORE per year. 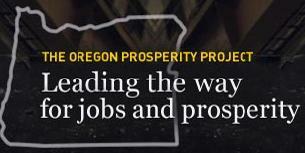 Manufacturing will be instrumental in bringing Oregon incomes back up to par. This session, we see two pieces of legislation that can help pave the way for more manufacturing in Oregon. Both are priorities. First, Representative Mike McLane (R-Powell Butte) is introducing a bill this session for expedited siting of manufacturing facilities, particularly in rural Oregon. This could be a key piece in helping to revitalize Oregon’s economy outside of the Portland Metro area. A second piece of legislation has been introduced that will add critical funding to a grant program established last year that gives local government the financing and tools to bring manufacturing sites to market-ready status. In one chart, we can demonstrate why these bills are important. Manufacturing is the foundation of Oregon’s economic growth. Across the entire spectrum of educational attainment, manufacturing is where the middle class and family wage jobs are in Oregon. Oregon manufacturing jobs pay more than non-manufacturing jobs for all levels of educational attainment – over 25% more for employees without 4-year college degrees and a whopping 65% more for employees with a Bachelor’s degree or higher. It may be the case gains from more general college education are flattening while costs of education are still increasing. An article in the Wall Street Journal recently showed the premium in pay for bachelor and advanced degrees has fallen sharply in the last ten years. Moreover, the statistics often used to promote a sharp expansion in college education dollars don’t usually take account of age differences but instead aggregate older professionals with newer professionals, and in so doing, work experience is erroneously attributed to educational obtainment. It might be the case we have to push the work ethic and the need and ability for every individually to be competitive, such as the Right-to-work and a flexible minimum wage. On the latter, many senior and younger adults already have a support system (pension or mom and dad) and just are looking to supplement their income/support system. Raising the minimum wage hurts the ability of Seniors and young people to earn a few extra bucks to supplement their existing support system. So, please we need more flexibility in the minimum wage, not the one-size fits all typical government solution.